I found a beautiful antique spool bed at my favorite junk shop. The turned wood details are too perfect for words and the chippy paint, wow. I wasn’t sure what to call the style of the bed so I did a little research once I got home (Google is your friend). 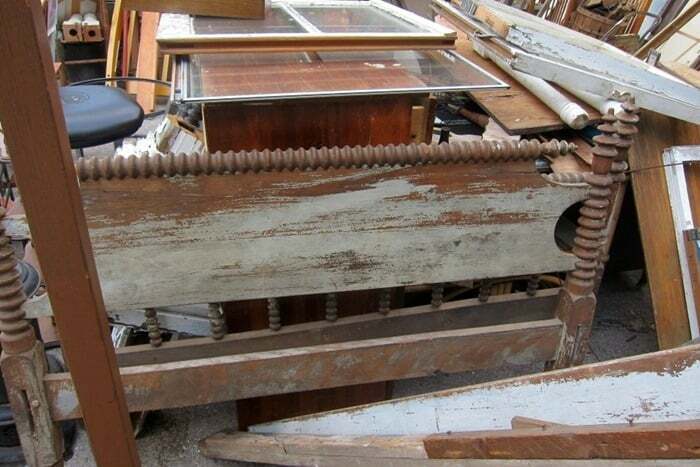 I found a photo of a similar bed on an auction website and the bed is called a Victorian Walnut Spool-Turned Bed. 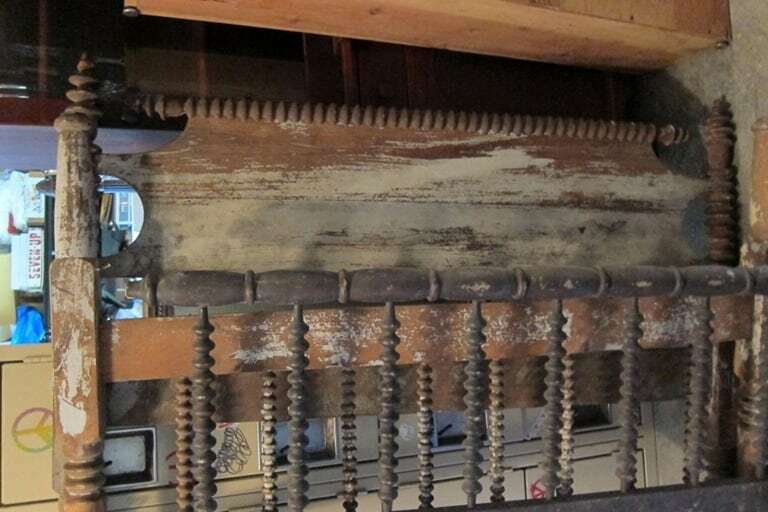 It was made around the middle to the end of the 1800’s. I’m not sure what I’m going to do with the bed. I don’t plan to use it as a bed. I’m thinking to use part of it on my mantel or maybe hang it on the wall or maybe make a bench. Any ideas for me. Did I mention how much I paid for this treasure? It’s been over a month since I bought it but I’m pretty sure the price was $10 and the bed came with the original rails. I found an antique bed a few years ago for $3! 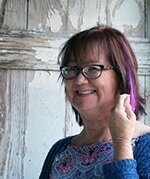 The makeover was gorgeous if I do say so myself. 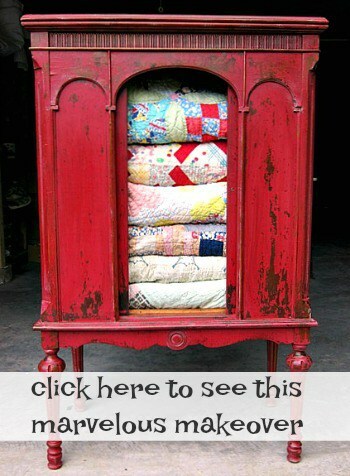 You can see it here…..Dusty Rose Antique Bed. 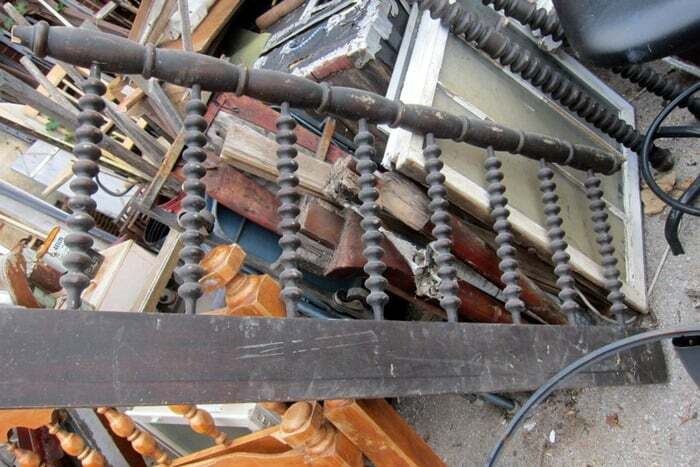 I also bought part of a headboard or foot board from another antique bed. Lovin’ those spindles. I haven’t had time to check the bed out for damages or to clean it up. More info on the bed to come later. I bought the all wood chest of drawers with the oak leaf appliqué at an auction over the weekend. I paid $55 for it. Not a steal but an okay price. I hope I can remove the leaf applique. Fingers crossed. The chest is very masculine looking and I think dark gray would be the perfect color. The wood drawer pulls are staying. 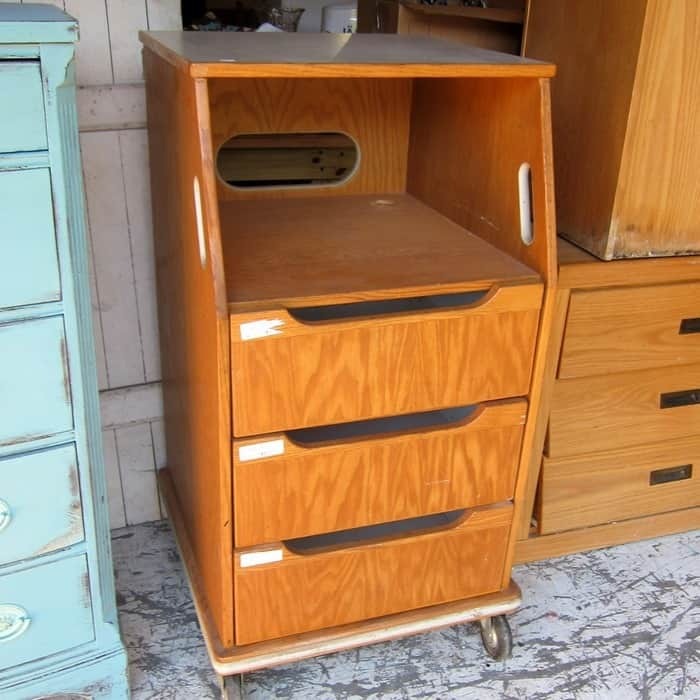 The storage cart on wheels was a steal at $5. It will be doing duty in the workshop. I love plaid and red. The three lunch boxes were sold as a set and I paid $6 for them at the auction. I had to have the one with the leather handle. Too cool. 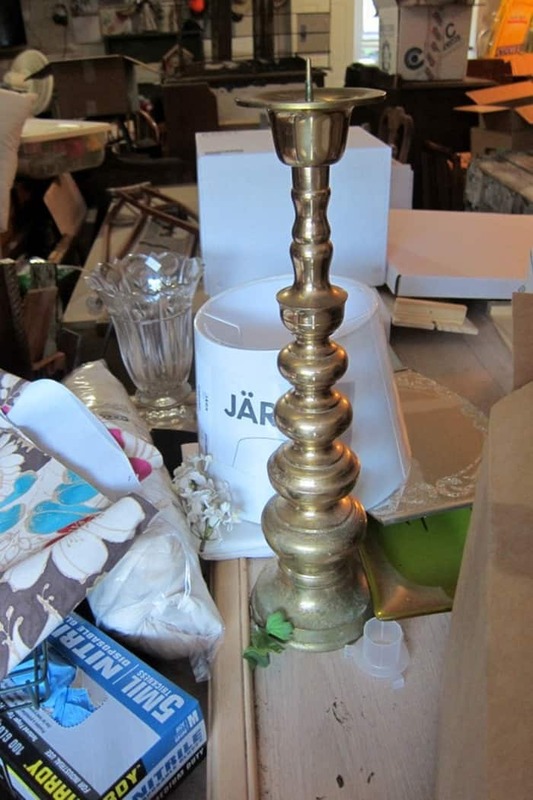 The tall brass candlestick came from the Goodwill. It was one dollar. True. One of the Goodwill’s in town has gone to pricing everything at $1. 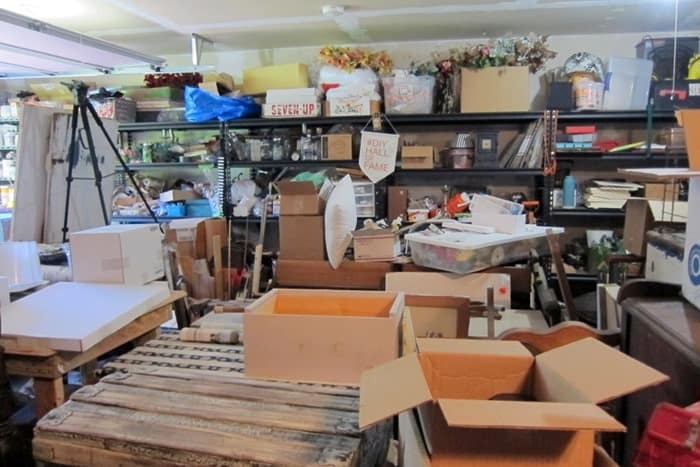 You can get some great deals but just about everything is thrown into gigantic boxes and you have to dig through the boxes. I can’t even reach my arms all the way across the boxes. Luckily the brass candlestick was on a shelf with glassware and other breakables. My Mom has a pair of these candlesticks. I remember she bought them from Home Interior. I know they were pricey new. Any of you have these candlesticks? Not sure what I’m going to do with this one. I have a black lampshade in my stash of stuff and it looked great sitting on the brass candlestick. I’ve never made a lamp and not sure the candlestick is wide enough for the wiring. Maybe I’ll just shine it up and put the lampshade on it anyway. Fake lamp. I bought these two pieces for $5. I’m not sure they were worth it. I only wanted the piece on the top and you can only see the back of it in this photo. Sorry. The top piece looks like a filing cabinet in the front. I think it would look great painted white and the hardware sprayed shiny gold. You can get an idea what I’m talking about if you look at this chest here. The last three photos show our messy workshop. 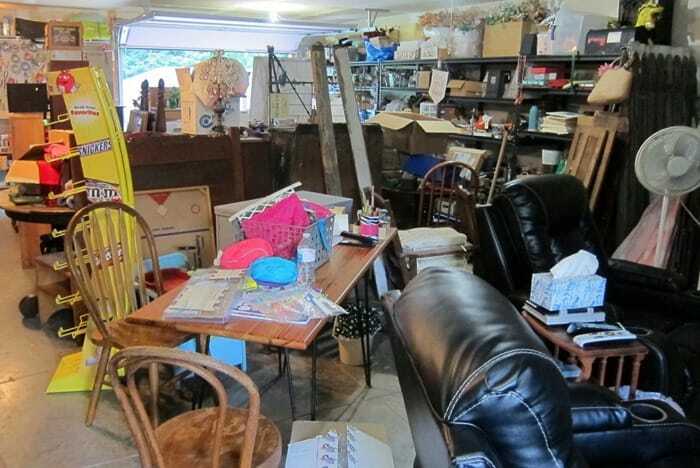 We’ve bought so much junk (good junk?) at auctions lately that it’s piling up faster than I can fix it up, paint it……whatever…….and get it to the shop to sell. I also have boxes of paint sitting around that need to be unpacked and Miss Sofi and friends have playthings scattered everywhere. The girls think the mess is cool because they have play tunnels made through the furniture and odds and ends. I made a video on one of my junkin’ trips and I included the prices you can expect to pay at my favorite junk shop. View the video below…. I don’t think the mess is cool. I have to get it cleaned up because all the clutter is driving me crazy. Wish me luck. Love those lunch boxes too! The bed is also gorgeous! Lately I’ve seen candlesticks and lamps being remade into outdoor solar lamps for the garden or porch. They’re pretty cool. This post of yours was full of goodies for me. Ha! 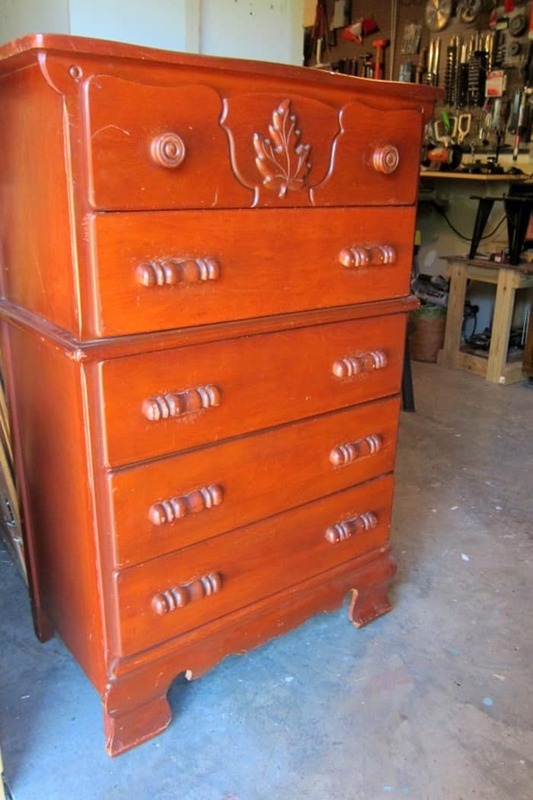 Please dont lose the oak leaf on the chest of drawers. I love it. We live in oak tree country and I love all that stuff. 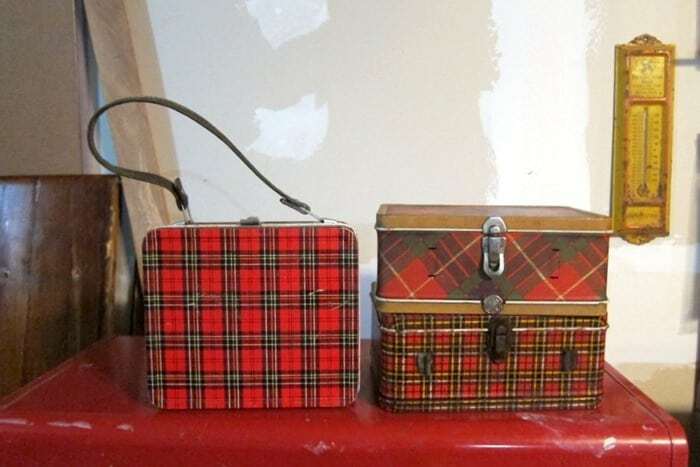 And those plaid lunch boxes! Wonderful.. Making a lamp is fairly simple-been there done that. Also rewiring one is pretty simple. And lastly the spool be is quite a find. You had a good week-lots of projects for you-can’t get bored now. No I’m not going to be bored! I’ll have to try the lamp one of these days. I think the brass candlestick is too skinny for the wiring. The “Junk Shop Video Tour” was not clickable, at least for me. Am I missing something? It worked for me Lizzy. Are you sure those are pictures of your workshop and not pictures of my painting/craft room in my basement? 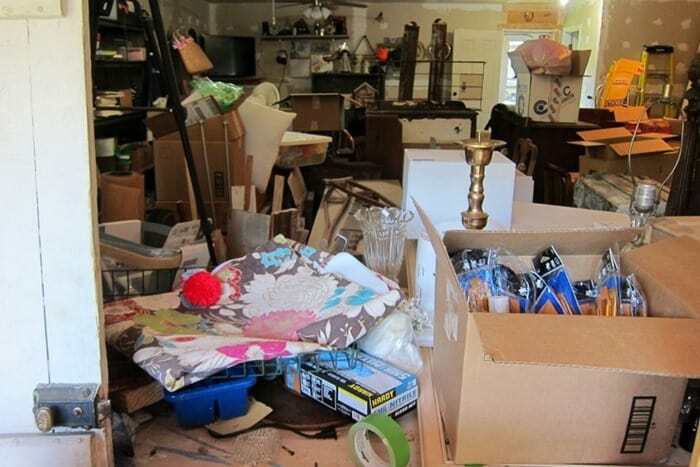 I can appreciate the clutter making you crazy. I’m trying to work my way through mine but I always seem to be adding to it instead of decreasing it. I’m sure you can relate. Good luck on your decluttering. I also found a green and red plaid lunch box at a yard sale. I like it too. Seems like everything you bought I also bought or have. We just have good taste I guess. 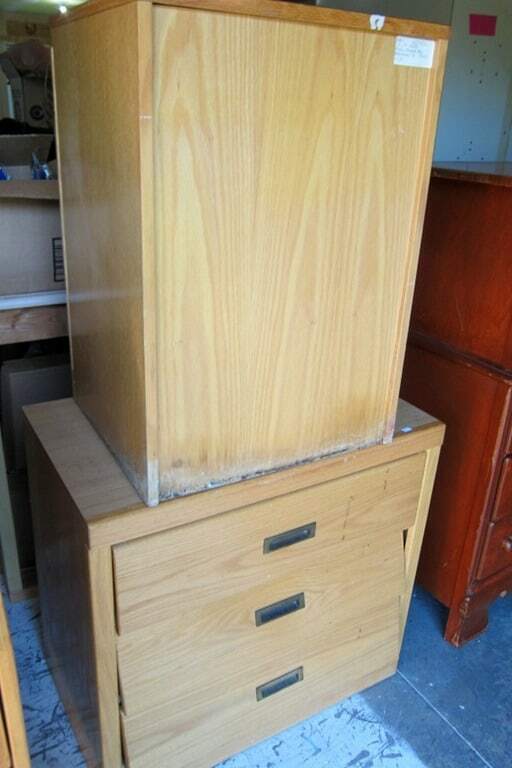 I also have a chest of drawers like the one you bought with the oak leaf. I would leave the oak leaf myself but I am curious as to how you paint it. I will probably give this to my daughter for her boys. One of her twins needs another chest and this would be perfect. I think I’ll leave it up to her to paint. I will be painting the chest to sell it and I think the leaf may leave some buyers out. Stay tuned for the paint job. Not sure yet what I’m going to do. Looking forward to see what your creativity makes of the items! Oh My Word! I LOVE LOVE LOVE the lunch boxes….I’m SOOO Jelly! Plaid is my friend, and any vintage box or suitcase MUST come home with me! These are the only lunch boxes I have. I’ve been jelly of plaid lunch box photos on my friends blogs and Pinterest. Now I have my own. I inherited a spool bed from my mother-in-law and gave it to my granddaughter. I think her mother is going to paint it white. That’s OK with me as I didn’t need another bed. She is using my mother’s bedroom furniture also. It is veneer but has the big round mirror and the chest of drawers is small like my mother was. I think she was 4’9″. Just right for my granddaughter. I love being able to pass down furniture that was inherited. It is so nice to have furniture passed down through generations. I know your granddaughter loves it.